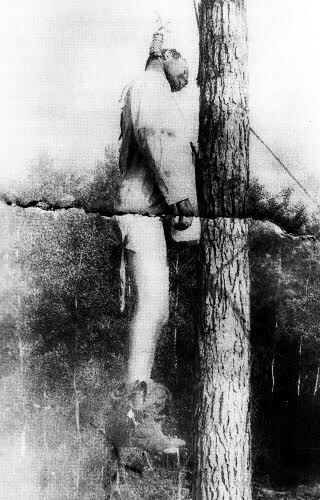 On this day in 1886, John W. Kelliher, known as “Reddy” or “Big Red”, was lynched by a mob of some five hundred people in Becker County, Minnesota. Kelliher had gotten into a fight with a rival pimp and gambler and the village marshal of Detroit (today, Detroit Lakes), John Conway, tried to intervene. Conway was shot dead for his pains, shortly before his wedding day. little business was done in Detroit that day. Men were to be seen in small groups in every part of the town, upon the streets, in the stores, saloons and alley-ways earnestly discussing the tragedy, and the many threatening countenances were ample indications that further developments might be expected, while many appeared anxious, apprehensive and excited, as though waiting for and fearing some terrible event. At precisely ten o’clock in the evening, several taps were made upon the fire bell in quick succession, and the fierce yell, which immediately followed, breaking harshly upon the oppressive stillness, was ample evidence that this was the understood signal for an execution by Judge Lynch. Farmers for many miles around had been coming into town all day, and many men arrived by the evening train from points both east and west; the town was thronged with men and at the ringing of the bell a mass of humanity surged toward the court house; a sledge hammer was brought into use; the sheriff and jailer were overpowered and the keys to the jail taken from them, and Kelliher was quickly brought face to face with his unlawful but determined executioners; a rope was thrown over his head and the cry “go ahead” was given; with probably fifteen men having hold of the rope, and pulling with frenzied zeal the mob left the jail and ran wildly down the street leading west, to the house that had been occupied by Big Red as a bagnio, and in a twinkling the rope had been thrown over the limb of an oak tree, and the body of Big Red was swinging in the air; the victim was doubtless dead long before the tree was reached, or if not dead certainly unconscious.